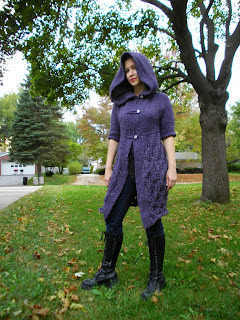 I poked through some of the versions of this hoodie on Ravelry, just to see what other knitters have done. I decided to use a Knit Picks yarn to make mine, but didn't want to use the Swish Bulky. Instead, I used Wool of the Andes Tweed in Indigo Heather. I held two strands together to get a bulky weight yarn for the pattern! I think it came out lovely! These pics are pre-blocking. I was way too excited to try it on and take pictures! I also think I might add one more button near the belt line. Decided to do the typical "JC Penny" shot! Lots of great patterns in this book! I'm going to make another of these hoodies in red! I love how your hoodie turned out. It looks great on you. I want to make one now. If only I could find the time. Hopefully after the holidays. Thanks! I had to have a selfish knitting week. I just put my head in the sand about all the knitting I HAD to do and did something I WANTED to do! Oooh, take the pic of the red one with Starkey. L'il Red Ridin' Hood! I really wish Knit Picks delivered to Ireland. I love the colour of your hoodie, but then again purple it's my favourite colour. It's lovely! I've finally started mine in a deep red. I'm trying to finish it before November. We'll see how that goes. I'd love to at least wear it to Breaking Dawn. :) What size did you make yours? I'm doing medium and it seems big. I made mine in Medium. It seemed to work out pretty well for me! I'm going to make a red one next, but I might go even longer! We'll see if I can manage that without it getting too heavy!